Depois das pedaladas no intenso nevoeiro, o dia seguinte acordou bastante solarengo e a pequena vila de Sigchos ganhou a normalidade que lhe assistia. Acabava-se a estrada e voltava a terra batida, em pequenas subidas e descidas à volta de um vale deslumbrante, por onde pedalámos até à hora do almoço. Avistando um telheiro resolvemos parar para almoçar, desta vez em boa-hora, já que minutos depois começava uma chuva torrencial que nos manteve parados umas quatro horas. O telheiro ficava no meio de uma pequena aldeia e a chuva começou à hora em que muitos miúdos vinham da escola e eram deixados no centro para caminhar até casa. Veio a chuva e tudo parou e as crianças abrigaram-se durante três horas, tudo isto sem avisarem os seus pais e também sem almoçarem até às quatro da tarde. Entretanto chegou uma senhora que vendia batatas fritas que comemos com convicção. Tentámos arranjar sítio onde ficar por ali mesmo, mas a obra missionária estava cheia e enviou-nos à aldeia seguinte Chugchilán, apenas a 4 quilómetros, cinco minutos de carro e quinze de bicicleta, de acordo com os italianos que nos deram as indicações. Como é costume em indicações dadas por não ciclistas o tempo triplicou e levámos 45 minutos a fazer a subida inclinada e lamacenta. Ao chegarmos perguntámos na igreja se tinham sítio para nos albergar e mostraram-nos a casa ao lado, um pouco a cair de podre, e ainda mais fantasma que a do dia anterior, mas pelo menos com um chuveiro (frio, evidentemente!). Parecia que a cada dia as nossas acomodações iam de mal a pior pelo que em Quilotoa já nos imaginávamos numas masmorras a levar com baldes de água fria. O dia seguinte começou com uma aveia tostada com fruta e mel (a nova receita que os argentinos nos ensinaram e que nos permite deglutir aveia com vontade) e uma nova estrada, quase toda em alcatrão, com uma pequena excepção para a parte enlameada, e ao que parecia ainda por inaugurar, em subidas e descidas suaves, a contornar um vale. Depois acabaram-se as subidas suaves e vieram as íngremes, até chegarmos ao que nos parecia o topo e pararmos para um snack curto a tentar evitar a chuva que se adivinhava. Mas vinha aí a pior parte do caminho, a subida dos 3700 aos 3900 metros de altitude, em muito poucos quilómetros, com ar rarefeito. A certa altura deixámos de ver o caminho tal era o nevoeiro, depois tivemos que nos apear das bicicletas porque, com excepção do Luciano, não aguentávamos a falta de ar e finalmente começou a chover, mas como não havia sítio onde parar continuámos quase em piloto automático. A chuva entretanto passou mas o frio era intenso e foi com muita alegria que nos vimos no fim da subida e iniciámos a descida até à aldeia hiper turística de Quilotoa. O Pedro e o Luciano negociaram um quarto de hotel para os quatro, que apesar de algo sujo tinha a vantagem de ter uma salamandra e água quente (que demorou a funcionar mas acabou por nos aquecer a todos). Quase já não saímos de perto da salamandra que tornou o quarto num forno confortável, um agradável contraste com a subida e com o tempo lá fora que era o equivalente a estar dentro de uma nuvem. A recompensa viria no dia seguinte quando finalmente fomos ver a lagoa, que enche a cratera de um vulcão. Já tinha (Sara) visto muitas fotos deste local e por isso o primeiro impacto não foi nada de especial, mas à medida que fomos descendo até à lagoa comecei a entender o quão especial este sítio é. 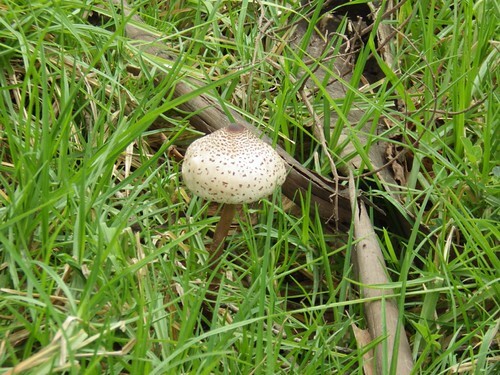 A água que vai mudando de cor consoante o céu, ora reflectindo a montanha à sua volta, ora passando a diversos tons de verde quando o vento começa a soprar, ora azul turquesa. 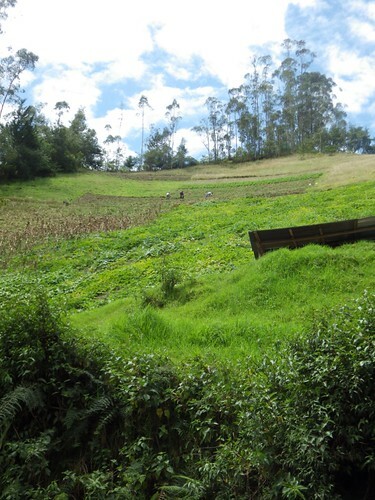 A paisagem à volta também é única, com as montanhas escarpadas a caírem até à água, a vegetação de alta altitude, as plantas douradas e especialmente o silêncio. No dia da visita os habitantes da aldeia local, nos seus trajes típicos, que nalguns casos incluíam sapatos com salto para as mulheres, e em todos os casos um chapéu em feltro, levavam cavalos carregados de areia para baixo e depois voltavam montados neles para cima, um verdadeiro espectáculo a adicionar ao que a natureza já nos proporcionava. Como tudo o que é bom acaba depressa pusemo-nos em cima das bicicletas e descemos páramo abaixo até à próxima vila, onde almoçámos. A escolha seria ficar aí ou acampar a meio do caminho. Comprada a comida e abastecidos com a água necessária lá fomos, desta vez monte acima e depois monte abaixo e depois monte acima outra vez, até uma pequena aldeia onde, à falta de melhor, acampámos junto ao cemitério. O senhor com quem falámos ainda nos disse que pagando podíamos dormir dentro da capela, mas optámos por ficar cá fora. E finalmente regressámos à panamericana no dia seguinte, mas sem queixas, já que fizemos o nosso passe mais alto da viagem (4000 metros de altitude), descemos e subimos o páramo, um autêntico regalo para os olhos, e depois quase descemos a pique até à cidade de Latacunga a 2800 metros de altitude. O caminho directo entre Tumbaco e Latacunga teria levado dois dias, mas assim foi muito mais divertido. 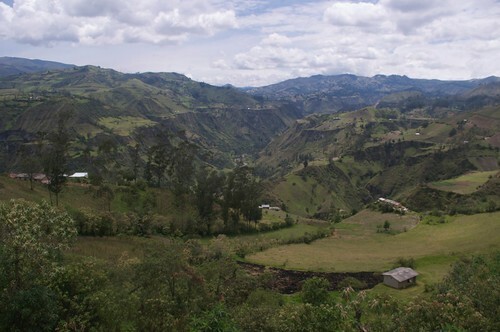 After pedaling in dense fog, on the next day we woke up to the quite sunny and small village of Sigchos that now seemed much normal than on the previous night. 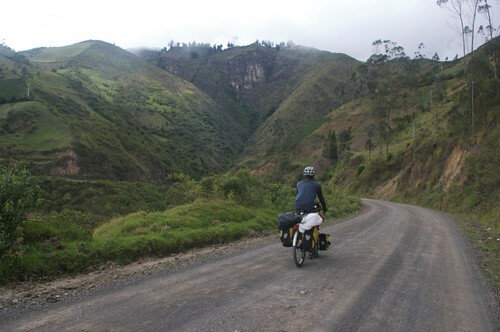 The road turned to dirt again, with small ups and downs around a stunning valley, where we rode until lunchtime. Spotting a shelter we decided to stop for lunch, this time with great timing since a few minutes later a pouring rain started and we had to stay there for the next four hours. The shed was in the middle of a small village and the rain started at the same times as some kids were coming from school and were left in the center to walk home. With the rain everything stopped and children took shelter for three hours, all without notifying their parents or having lunch until four in the afternoon. Two hours later a lady got there and started cooking french fries that we ate with pleasure. 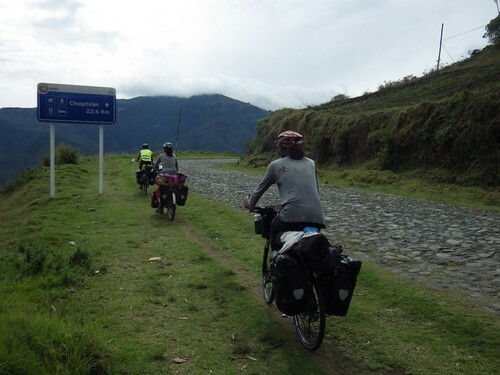 We tried to find a place to stay right there, but the missionary building was full and they sent us to the next village Chugchilán, just 4 kilometers away, a five minutes drive or fifteen by bike, according to the Italians who gave us directions. As usual in directions given by non-cyclists the time tripled and it took us 45 minutes to make the sloping and muddy climb. When we arrived we asked at the church if they had a place where we could stay and they showed us the house next door, a little rotten, and even more ghostier than the one on the previous day, but at least with a shower (cold, of course!). It seemed that every day our accommodations went from bad to worse so in Quilotoa we already imagined ourselves in some dungeons being wet by buckets of cold water. The next day began with toasted oatmeal with fruit and honey (a new recipe that the Argentines have taught us and that allows us to swallow oatmeal with will) and a new road, almost all of tar, with one small exception to a muddy part, and with gentle climbs and descents, surrounding a beautiful valley. Then came the ultra steep, until we get to what looked like the top and stop for a short snack trying to avoid the rain that we could guess was coming. But then came the worst part of the way, climbing from 3700 to 3900 meters of altitude, in very few kilometers, with thin air. 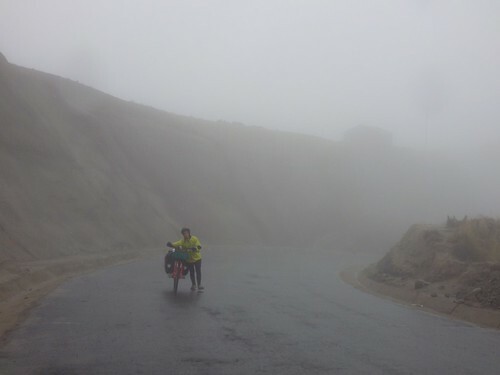 At one point we couldn’t see anything anymore due to the intense fog, then, apart from Luciano, we all had to push the bike by hand because we couldn’t cope with the lack of air and finally it started to rain, but as there was no shelter so we continued in a lot of effort. 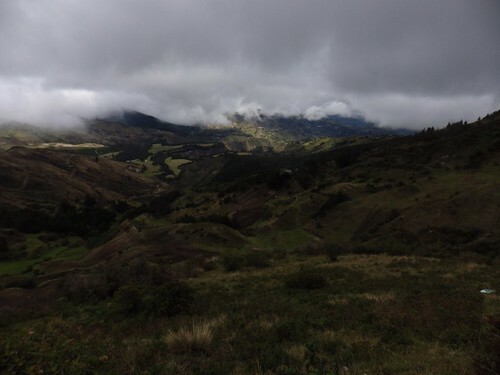 The rain eventually passed but the cold was intense and it was with great joy that we got to the end of the climb and we started the descent to the super touristy village of Quilotoa. Pedro and Luciano negotiated a hotel room for the four of us, that although it was a little dirty it had the advantage of having a burning stove and hot water (it took a while to work but it finally warmed us up). We almost didn’t leave the room for the rest of the day, since with the burning stove it became similar to a comfortable oven, a nice contrast with the climb and the weather outside, similar to being inside a cloud. The reward would come on the next day when we finally see the lagoon, which fills the crater of a volcano. I (Sara) had seen many pictures of this place and so the first impact was not anything special, but as we went down to the pond I began to understand how special this place is. The water that changes color depending on the sky, sometimes reflecting the mountain around it, sometimes going several shades of green when the wind begins to blow, sometimes turquoise. 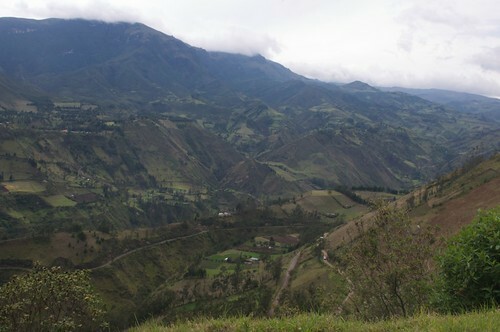 The landscape around it is also unique, with rugged mountains that fall into the water, high altitude vegetation, golden plants and especially the silence. On that particular day the inhabitants of the local village, in their traditional clothes, some of which included shoes with a little heel for women, and in all cases a fedora hat, led loaded horses with bags of sand down to the crater and then returned mounted on the same horses, a real show to add to what nature was already providing us with. 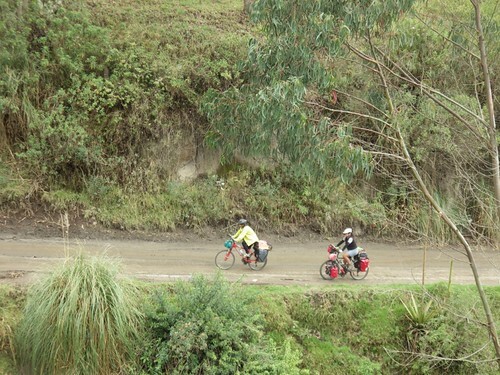 Like everything that is good finishes quickly we put ourselves again on the bike and went down on the paramo to the nearby village where we had lunch. The choice would be to stay there or camping somewhere along the way. 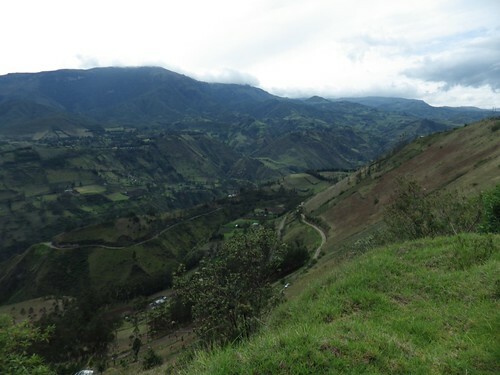 We bought food and supplied with the necessary water and continued, this time up the hill and then down the hill and then up again, to a small village where, lacking a better option, we camped next to the cemetery. The man to who we asked permission told us taht if we pais we could sleep in the chapel, but we opted to stay outside. 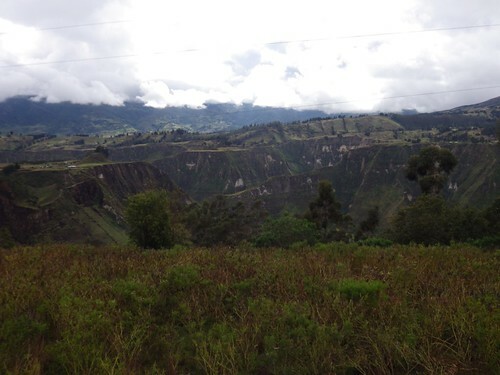 And finally we got back to the Pan-American highway on the next day, but no complaints, since we made our highest pass of the trip (4000 meters), descended and went up the paramo, a real feast for the eyes, and then dropped down to the city of Latacunga at 2800 meters. The direct path between Tumbaco and Latacunga would have taken two days, but this way was so much fun. Esta entrada foi publicada em Ecuador, feitos|achievements, natureza|nature com as etiquetas Quilotoa. ligação permanente.